GenreOnline.net: More To Enjoy Than Not & Thank You James Cawley! Okay, here is my quick no spoilers review of the first of two new episodes to be released this year of Star Trek: Phase II. 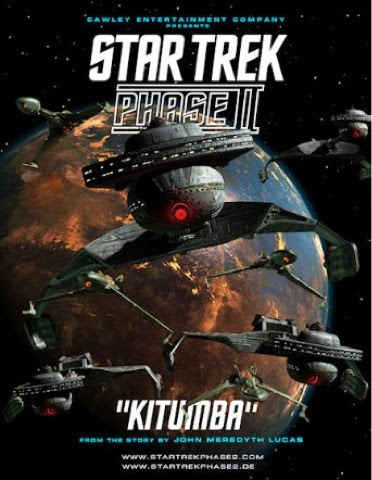 The episode entitled "Kitumba" was based on a two-part script written in 1977 for the Phase II series, but was revised into one hour and five minute long episode, which ironically might be close enough to what two parter without commercials will soon be on television for an hour long series with adverts. The swan song for James Cawley is Captain Kirk is honorable and the performances from the series regular actors, who have been with Mr. Cawley producing the series with a goal of fleshing out the final two seasons of Star Trek: The Original Series with the animated series taken into consideration so as to show the transition toward the Star Trek: The Motion Picture setting and look is admirable. Occasionally some of the Klingon makeup just looks bad and I did not like one visual reference made because it seemed as though it were placed as an after thought to keep some kind of continuity with Star Trek Into Darkness, which is in it's own separate universe. There is a verbal reference to an event in Abrams' Star Trek, which I did not like either because it conflicts with what we know of Kirk's childhood from The Original Series. However it is not beyond the possibility that something like what is referenced did happen in the original timeline. Fans will discover little Easter egg references related to events from Star Trek: Enterprise and things set up to follow in the twenty fourth century television programs too. Where the episode seemed a bit hampered was in the use of non professional actors and extras to portray the Klingons. Some are just plain awful and I found myself squirming at certain sights within a pub setting. Yet there are moments of good old Star Trek camp that seemed refreshing. I am mixed on the pacing because of the nature of the episode. To go into that further would to be risking more spoilers. However and as a whole there is more to enjoy than to cringe at in this episode of Star Trek: Phase II and the link to watch it for free on YouTube is below. Please cut and paste it into your browsers if it is not active so one can view the episode. This series is made not for profit, but for admiration and love of an American sci-fi television classic. Nothing could be more sincere and of all the fan film productions out there, this is the only one I have found to truly cross the boundary into professional with enough support, participation and cooperation from those involved with Star Trek professionally that I personally consider it part of my own imaginary Star Trek cannon and what better complement could a reviewer give to a production such as this. Thank you. Big thanks to James Cawley and everyone involved with Star Trek: Phase II for your labor of love. May you all Live Long and Prosper in the knowledge that your mission has been a success. Episodes can be viewed at www.startrekphase2.com and please donate to the production if you can. Thank you again.